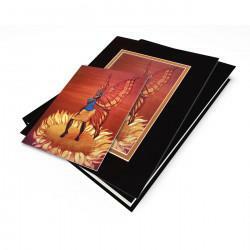 Welcome to the African American Art Card Collection from Designs For Better Giving. We take great pride and joy in bringing the best artists in the field of fine contemporary African American Art today. We offer all occasion greeting cards and blank note cards, Journals, Address books, magnets and packaged Thank You notes featuring the images of Carlos Spivey, George Bernard III, Aileen Ishmael, Charles Bibbs, Charles Grant, Dexter Griffin, Bryan Greene, Keith Mallett, Gloria Lovelady and Howard Marshall, Jr.
All of are cards are printed with the highest quality on recycled card stock and all of our orders are shipped the same day. We would like to that you in advance for shopping with us today. "The Dance Collective" Gift Set, artwork by Carlos Spivey The perfect gift for your loved ones, o..
"Da Spoon" Gift Set, artwork by Carlos Spivey The perfect gift for your loved ones, or a great gi..
"Young Famadu" Gift Set, artwork by Carlos Spivey The perfect gift for your loved ones, or a grea..
"Indigo Leaps" Gift Set, artwork by Carlos Spivey The perfect gift for your loved ones, or a grea..
"April Sunflower" Gift Set, artwork by Carlos Spivey The perfect gift for your loved ones, or a g..
"Girl Friends" Gift Set, artwork by Carlos Spivey The perfect gift for your loved ones, or a grea..
"Love Projection" Gift Set, artwork by Carlos Spivey The perfect gift for your loved ones, or a g..
"3 Kids on the Hill" Gift Set, artwork by Carlos Spivey The perfect gift for your loved ones, or ..
"Frisco Girls" Gift Set, artwork by Carlos Spivey The perfect gift for your loved ones, or a grea..
"Gossop" Gift Set, artwork by Carlos Spivey The perfect gift for your loved ones, or a great gift..
"The Burgandy Room" Gift Set, artwork by Carlos Spivey The perfect gift for your loved ones, or a..
"Honey Dew Drop" Gift Set, artwork by Carlos Spivey The perfect gift for your loved ones, or a gr..
"The Burgandy Room Band" Gift Set, artwork by Carlos Spivey The perfect gift for your loved ones,..
"Friday Night at The Burgandy Room" Gift Set, artwork by Carlos Spivey The perfect gift for your ..
"Little Dancers" Gift Set, artwork by Aileen Ishmael The perfect gift for your loved ones, or a g..
"Heritage" Gift Set, artwork by Aileen Ishmael The perfect gift for your loved ones, or a great g..
"Friends" Gift Set, artwork by Aileen Ishmael The perfect gift for your loved ones, or a great gi..
"Graduation Day" Gift Set, artwork by Aileen Ishmael The perfect gift for your loved ones, or a g..
"Blue Note" Gift Set, artwork by Aileen Ishmael The perfect gift for your loved ones, or a great ..
"Guardian Ancestor" Gift Set, artwork by Aileen Ishmael The perfect gift for your loved ones, or ..